WebConectada: Twitter event: "The Berlin wall project"
Twitter event: "The Berlin wall project"
WHO? Senior 5 Newlands + Senior 3 Las Cumbres + Anyone willing to take part! A white sheet of paper and a pencil. A camera or telephone with camera + what you need to download your photo to your computer. 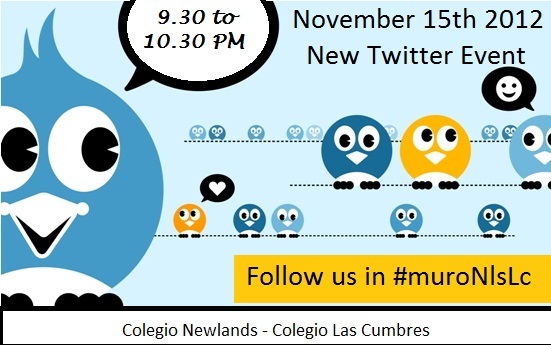 Be online at 9:30pm on Tweetchat following #muroNlsLc connected with your Twitter user. Doing this, each of your tweets will already have the #muroNlsLc hashtag written. Every 15 minutes there will be a new task tweeted for you to complete in a tweet. If your tweets need more than 140 characters you can use twitlonger BUT always remember to write the #muroNlsLc hashtag because if you don`t we will not see your tweets. When we finish I will generate a Tweetdoc with all your contributions and you will make a Storify with a selection of resources to explain the project.